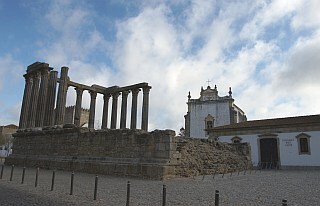 Evora is southeast of Lisbon, and stands majestically on the horizon of the Alentejo plain. The historical part of the town is protected by fortified walls, which was typical of cities during the Golden Age. Because of its importance, it attracted many Architects from all over the world, leaving behind a rich architectural heritage. Consequently, its historical centre has become a World Heritage Site. Conquered by the Romans in 59BC, there is still evidence of their presence with ruins such as the elegant Temple of Diana which dates back to the 2nd century. There is also the Porta de Dona Isabel gate, and the Roman baths which are underneath the Town Hall. In contrast to its bright sunny squares, the narrow medieval streets are more reminiscent of the period while they were under Arab occupation. Although it is quite easy to walk to most of the sites, a pleasant alternative is to enjoy a tour by horse and carriage. Evora was chosen by the Kings of Portugal to be their seat of court. Therefore many palaces and monuments were built, especially during the 15th and 16th century, with the Palacio dos Duques de Cadaval being a fine example of military architecture of that time. The Praca do Giraldo square has a beautiful 16th century marble fountain and an abundance of friendly sidewalk cafes. At the far end of the square is the Igreja de Santo Antao built in 1557. One particular street you should look out for is the picturesque Rua das Casas Pintadas otherwise known as the street of painted Houses. Here you will find a courtyard with a small gallery exhibiting paintings commissioned by the great Portuguese explorer, Vasco da Gama, who lived in Evora. The Gothic Cathedral in Evora is the largest in Portugal. The portal is flanked by a group of expressive looking Apostles who look as if they are inviting visitors into the church. The Cathedral also has a museum inside, which contains a valuable collection of sacred art. The upper choir stalls are of the Renaissance period carved in oak, and is the oldest one still active in Portugal. There are many churches in Evora, but one in particular that you are unlikely to forget is Capela dos Ossos. Inside is the macabre site of the bones of no less than 5,000 monks and nuns embedded into the walls, and on the door is a message which when translated means ‘our bones are here, we await yours’. There are a number of convents with the oldest being the Convento de Santa Clara dating back to 1452. The 15th century Convent Sao Joao Evangelista is now the Pousada Evora, a luxury four star hotel. Inside the 17th century Convento das Merces is the Evora Decorative Arts Museum, with a collection of church vestments and furniture. The Universidade do Espirito Santo was founded in 1559. In 1973 it became the present-day Universidade de Evora with a beautiful cloister that has a double gallery Some of the rooms that open into it are still equipped with the old professor's chairs and benches from days gone by. One of the chapels in the Igreja do Colegio contains the large wooden crucifix, which was always carried at the head of processions led by the Inquisition. There are many activities in the area that you can enjoy while visiting this beautiful city. They include hunting, mountain bike tours, four-wheel driving, horseback riding and hot air ballooning. So if you wish to take your time and stay for a few days, the Pousada Evora (Hotel Loios) is an excellent choice with regard to elegance, excellent cuisine and a convenient location.